I thought I’d sneak in a quick Easter post among the Kitchen Remodel series. You know, because it’s timely. Every year, Dan and I put together Easter baskets for our nieces. I know they’ll be getting baskets from other family members, so I try to keep our baskets small, free from candy/sugar, but filled with fun items. I thought I’d share what I put in them in case you still needed some ideas for last minute basket fillers. Let’s start with the basket itself. I know some people buy a nice wooden basket and use that same basket each year. Others buy a new one every Easter. To me, a basket is fine and good, but it’s not really something you (or kids) use on an everyday basis. And whether you use the same basket, or a new one each time, you have to store those baskets somewhere. So, instead of a basket, I try to buy a storage tote, sand pail, or other bucket like item that has a use other than a used-once-a-year Easter basket. This year, I got the girls pails to use in the sandbox, at the beach, or in the pool. I thought it was so cute that a little shovel came with each bucket. I try to be on the lookout for little items I think the girls will like in their baskets throughout the year, so I’m not searching for (and buying) a bunch of stuff they don’t need a couple weeks before Easter. 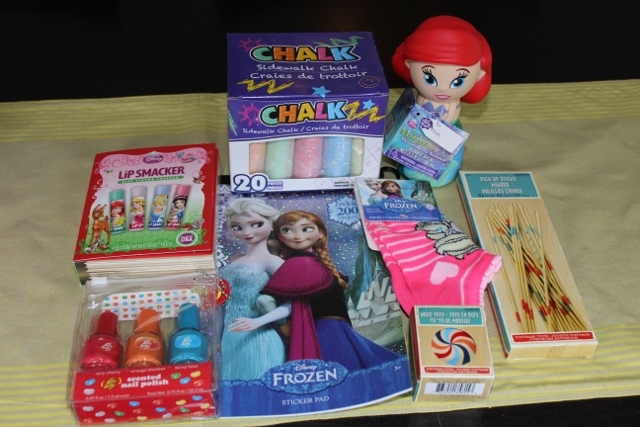 In fact, the Disney Princess Lip Smackers and bubble baths, and Jelly Belly scented nail polish kits were in the Target Christmas stocking stuffers aisle when I bought on clearance after the holidays. Since they aren’t adorned with wreaths and mistletoe, they don’t look Christmas-y and go great in the baskets. One type of gift I always love getting the girls are items that let them put their creative imaginations to good use. With this purpose in mind, sidewalk chalk is always a must for my Easter baskets. Maybe I’m just hoping for warmer weather, but once it’s nice out, chalk reigns supreme. While at Michael’s one afternoon, I discovered an aisle that had some old school games. How cute would that be in an Easter basket? I bought pick up sticks for one niece, a set of kiddie card games, including Old Maid, for the other, and both got a yo-yo. Finally, as both girls love Frozen, I thought they would each enjoy a 200 pack of Frozen stickers and a pair of Frozen socks. You know, just for fun. 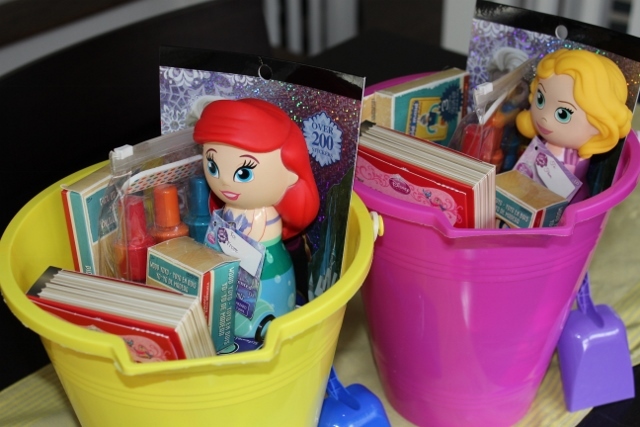 I just tried to place everything into the sand pail as neatly as possible (so everything fit), and attached a printable Easter basket tag (not pictured, but found here) to write each girl’s name. There’s not a ton of stuff in each basket, just a bunch of little fun gifts I think the girls will really enjoy. I hope they like these! We’ll be back to regularly scheduled (kitchen remodeling) programming next week.